On the 21st of November, we were honoured to win the Children and Young People Now (CYP Now) Leaving Care Award and receive a Highly Commended for our Partnership with Glasgow City Council – our first ever national awards. The CYP Now Awards aim to recognise and celebrate the innovative and inspiring initiatives taking place all over the UK by professionals who work day-in, day-out, to improve the life chances of children, young people and their families. TV presenter Zoe Salmon compered the awards evening while National Lottery voice Alan Dedicoat was on announcing duties for all the finalists.When we first started, now 11(!) years ago, at St. Andrew’s RC Secondary in Glasgow we had one simple goal: to better support care-experienced young people and help them realise they were just as talented and deserving as their peers. After much trial and error we found that one simple thing worked: relationships. By matching each of these wonderful young people with a mentor, who’s there simply for them because they care, these pupils flourished. Results quickly showed that not only were more young people progressing from school to college, university or full time work – those young people also told us they felt more confident and excited for their future. 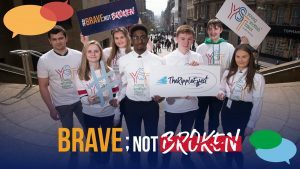 This realisation has led us on a fantastic journey and has allowed us to work with and help change the lives of many more young people – currently more than 1500 each week in Glasgow alone. We want to take a moment to thank all our wonderful partners who make up the MCR family – young people, mentors, schools and all the fab organisations that help us: this award truly is yours. Thank you for your commitment to our young people each and every day. 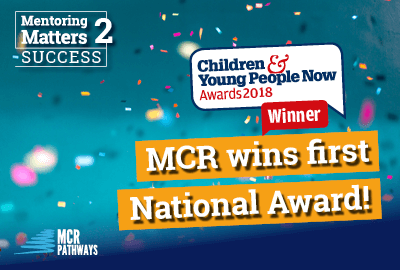 “Everyone at MCR Pathways is absolutely thrilled by this UK-wide recognition for the impact our charity has made to date, most importantly improving the prospects and opportunities available to the many young people supported. “Equally important to acknowledge is the essential role of so many people behind our success so far. In particular, on behalf of MCR Pathways I’d like to sincerely thank the people of Glasgow, our longstanding partners at Glasgow City Council and its 30 secondary schools, our dedicated staff, volunteers and trained mentors and, of course, the young people who we are fortunate enough to support. It’s a true team effort and the positive outcomes are only achieved because of this. 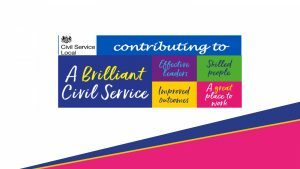 “We’re very grateful to CYP Now for the award and high commendation and we’re completely focussed and committed to continuing our progress in 2019 to allow us to extend our reach and help many more young people across the country.”As well as the 23 category winners, 10 ‘High Commendations’ were awarded. The full list of winners and commendations can be viewed here. Thank you to the Children and Young People Now Awards for showing the UK how much #MentoringMatters2 Scotland’s young people. We are actively looking for mentors in Glasgow, Aberdeenshire and Aberdeen. There has never been a better time to get involved and make a life-changing difference. Become a mentor today.